As a wedding photographer with a marketing degree, I'm always thinking about how to attract my ideal client. How can I attract couples who share my values, appreciate my work, and have a similar aesthetic to my brand when planning their wedding? I firmly believe in helping couples find the right wedding photographer for them! I want every couple to have their dream wedding day and beautiful photos to remember it by. With that being said, when Alie’s inquiry came into my inbox, my heart skipped a beat. Literally. She described her plans to marry her sweetheart on their 10 year anniversary. They would elope in Joshua Tree, a place that had become a part of their story, surrounded only by 10 guests. They rented a classic Mustang to get around in Palm Springs for the weekend and use for photos in the desert. Afterward, they would enjoy a beautiful candlelit dinner with their guests back at the L’Horizon Hotel in Palm Springs. And she had hired the talented wedding planner Fawn Events to work their magic and bring it all together. Beautiful location, amazing photos, and surrounded by a tribe who loves them. She was speaking my love language! I told her that if I were to get engaged today, that is exactly the kind of wedding I would plan. The cherry on top was when she told me she’d been following my work for years and once she got engaged she knew right away she wanted to have me photograph her wedding. "WHAT?! Is this for real? !” I asked myself. This seemed too good to be true. I had met my dream client. From the Bride: John swears we met at a music festival in the summer of ‘08, but I don’t remember ‍meeting him at all! That fall I moved in with a friend and her roommate in Colorado and John was the other roommate!! We have lived together for our WHOLE relationship. We had 9 years to get serious. After school, we moved from Colorado to Kansas City and soon after bought a house. Life progressed from being broke college kids to actually adulting without us really realizing it. We always talked about marriage, but I always felt like that was such a grown-up thing and never felt “ready.” On my 30th birthday, I saw a ring in a shop in NYC that made me think “that’s my kind of ring.” I had never been traditional and all of a sudden I was in love with a diamond ring. I could see myself getting married and I realized I was ready. John has always been ready, so, soon after we were recreating the ring and planning a wedding. From the Bride: John booked a weekend getaway at The Sanctuary in Paradise Valley, Arizona (I have a thing for the desert). I am always one to figure things out and John is not a secret keeper so I knew something was up! He waited until the second night we were there which kept me on my toes. It was sunset and I was taking pictures. When I turned around he was on his knee proposing, the ring basked in the golden light. 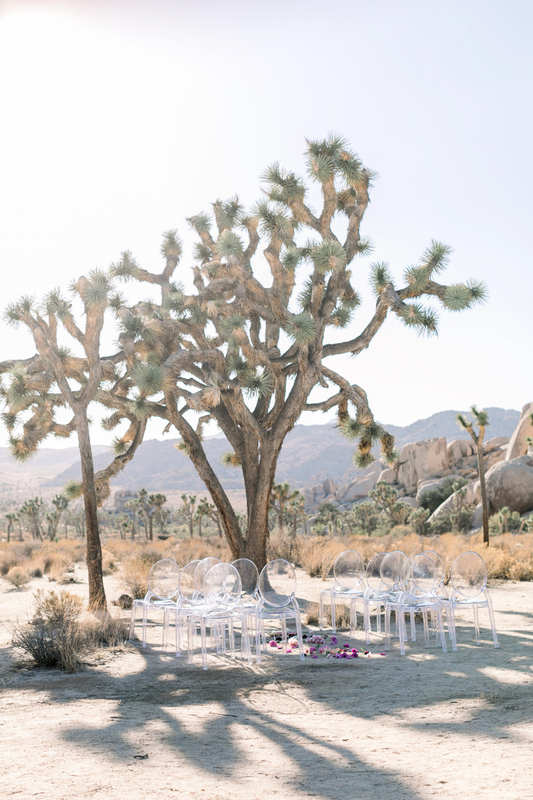 What was the inspiration behind your elopement in Joshua Tree? From the Bride: There is something magical about the desert. It is striking and minimal and bold and that ended up being the inspiration behind our wedding. How did you decide to elope in Joshua Tree? From the Bride: 100% because I had stumbled across Lovisa Photo on Instagram years before and saw how Erin captured Joshua Tree and all of its magic, and it had to be there and it had to be with her. She was the first wedding vendor I nailed down! From the Bride: We loved the drive back to the resort from Joshua Tree after the wedding ceremony in Joshua Tree. The sun had set and the light was fading. It was just the two of us in the vintage Mustang. We were married and everything was calm. It gave us time to reflect on the day, just the two of us. It felt simple and big at the same time. Something we had talked about for 10 years had finally happened just the way we wanted it to. From the Bride: I’d say don’t let anyone (or their opinions) dilute your vision. Instead, let them help you build your day just the way you want it. I had family members tell me what I wanted when I knew it wasn’t right for me and I just politely acknowledged their thoughts and kept planning things the way I wanted them. Trust the professionals and take their advice. I knew what I wanted and Laura (Fawn Events) and Dawn (Earthbaby Flowers) knew what I didn’t even know I wanted. In the end, the day was a curated celebration that reflected our taste and made us smile. 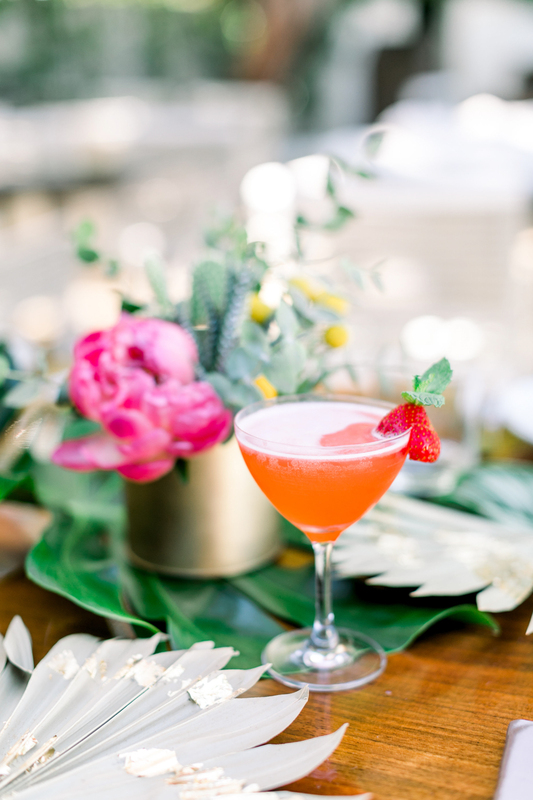 All photos captured by Palm Springs Wedding Photographer Lovisa Photo. If you liked this Joshua Tree Elopement at L’Horizon Palm Springs, you may also be interested in this Joshua Tree Elopement as well as this Colony 29 wedding in Palm Springs.